Confession time. I'm daunted by meat that is not sold in neatly packaged styrofoam trays designed for two servings. This is weird because I spent a good part of my life in a developing country where your meat comes from an animal that you were petting ten minutes ago. I have seen everything from the actual slaughter, to the draining process, to the nonchalant purchase of giant legs of lamb and entire sides of beef (complete with flies buzzing around). There's probably a direct correlation between my childhood meat market memories and my inability to purchase anything other than boneless, skinless chicken breast and boneless steak. Oh wait, I also buy lots of fish and shrimp but again, nothing with heads or skin. Yup, for a staunch carnivore, I'm a definite meat wimp. This became a problem when we moved to Texas. See, brisket is king in Texas. Brisket tacos, brisket enchiladas, brisket hash. There's a definite brisket culture here and like any culture, you gotta go for immersion unless you think you're multicultural simply because you eat the occasional samosa and watch the Cinco de Mayo parade. So I think, "I like brisket. I should make some brisket." Sounds good in theory except that brisket is generally sold in giant 12 pound hunks complete with a solid layer of pure fat. Everything is indeed bigger in Texas. I'll admit it, a part of me definitely contemplated walking away from the meat section shamefacedly. A big part of me. But then I thought, one day, I'm going to have to look my kids in the eye and I don't want them thinking I'm a coward. I heave a giant brisket into my cart and race toward the check-out line before I can change my mind. At home, I feverishly research my brisket cooking options while the giant fatty brisket mocks me. I opt for both a dry rub and gravy cooking method. I can see you brisket purists shuddering but there's a logic to my madness. I want the spices to crust the meat but I also want the final product to be saucy. You want your meat to have a bit of an attitude, right? Game time. I trim lots of fat off the brisket. Again, hear me out brisket purists. I have eaten enough brisket to know I'm not a fan of fat interrupting the flow of my brisket. I do leave a thin layer of fat just so it can melt into the meat during the cooking process. I make the gravy, sear the brisket with the dry rub and suddenly realize, it's now 11 p.m. on a Sunday night. I'm guessing my boss isn't going to think brisket making is an appropriate excuse for my lateness (though I can't understand why- I mean, other people are late because their kids are sick. I am late because I make brisket. This makes perfect sense in my world). I pop the brisket in the oven and go to bed. 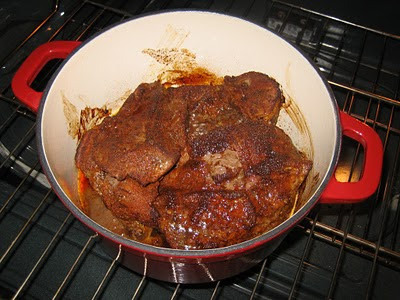 I wake up bleary-eyed a few hours later, groggily feel my way to the kitchen, flip the meat over and continue baking. I wake up again a few hours later and pull the pot out. It smells awesome and I seriously consider making myself a 3 a.m. brisket sandwich. I refrain, not because it's 3 a.m. but rather, because I know the hubster will be mad I ate brisket without him. 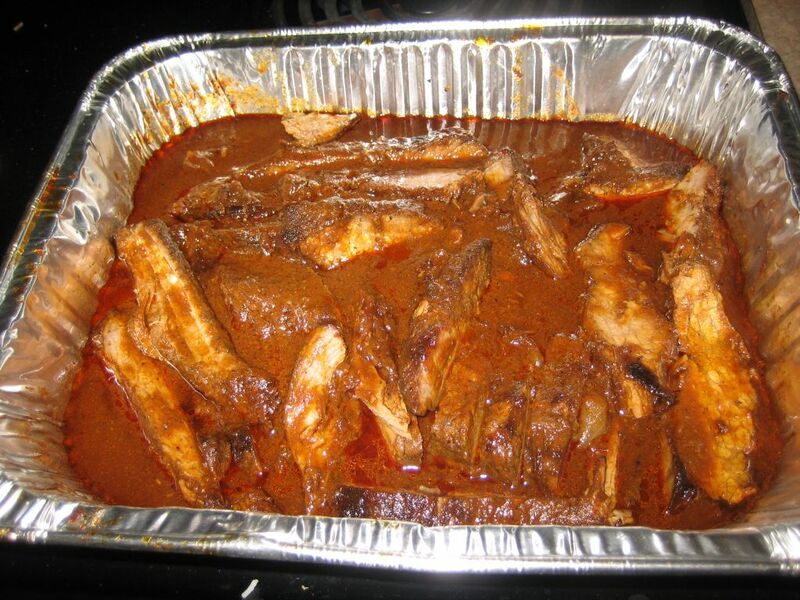 The next day, I shred the brisket to allow the gravy to permeate. And that is the beginning of the BEST WEEK EVER. We ate brisket for every meal possible. 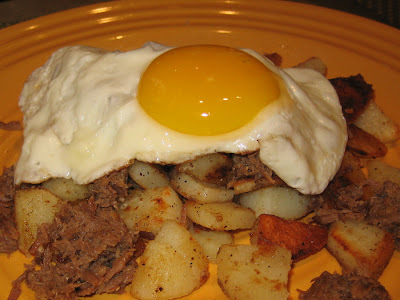 My personal favorite: the brisket hash. Half breakfast, half dinner, all delicious. I wish this story ended with me telling you I'm over my fear of unfamiliar cuts of meat. The fact is, I still dread cooking a whole chicken or a T-bone but I'm no longer terrified. That's gotta count for something. Combine all ingredients for the dry rub. Mix well. Place the brisket in a deep baking dish. Massage with dry rub. Refrigerate overnight. The next day, heat oven to 375 degrees. Roast brisket, uncovered, for thirty minutes. In the meantime, in a pot on the stove, add 3 tablespoons of oil and cook onions and garlic until golden. Add paprika, salt, and pepper and cook for 1 minute. Add three cups of water and bring mixture to a boil. Pour the onion mixture over the brisket. Cook brisket cover, with lid ajar, for 3-4 hours until brisket is tender. Check pan occasionally and add more water if necessary. Remove brisket in onion mixture from oven and let cool. Remove brisket from pan, scraping onion mixture back in to the pan. Wrap brisket in foil and refrigerate. Spoon onion mixture in to a bowl, cover, and refrigerate. A few hours later (or the next day), discard fat from the onion mixture, add enough water to measure 3 cups total, and blend onion gravy until smooth. Pour onion gravy in to a pot, add tomato sauce and brown sugar, and cook until gravy is smooth and thick (about 45 minutes to 1 hour). Heat oven to 350 degree. 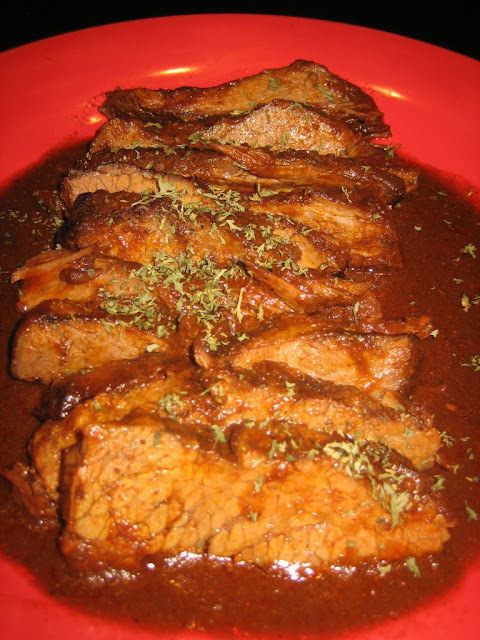 Slice brisket against the grain, place on large oven-proof pan, pour the gravy over it and heat 30 minutes. Recipe adapted from 2 recipes on Epicurious, including this Brisket Rub and this Brisket. Heh @ Texas furball! I'd definitely be down for a crash course, especially if it means we eat more brisket! This reminds me of the time that my old roommate Harold (who also posts on my blog) bought something like 10 corned beef packages (post St. Patrick's day sale) and that's pretty much all we ate for a month. Brisket is at least marginally healthier than corned beef. I think. Please don't correct me. In conclusion, I thought it was very sweet of you to restrain yourself until you could share with Nadeem. However, next time consider waking him with brisket. There are not many reasons I'd want to be woken up at 3 in the morning, but slow cooked meat is definitely one of them. Z- This Harold sounds like a wise man. I imagine you guys got pretty creative with corned beef. Corned beef on cereal, corned beef and jelly sandwiches, corned beef brownies. The possibilities are endless!